Seriously! I did add up my miles today and in less than a month, I did travel 20,000…give or take a mile or two. So now I’m home for awhile, which I’m sure for the moment that AlleyCat is very happy about! I’m sure sooner or later she will get tired of seeing me and give me the royal snub! How is your cat’s math? AlleyCat’s is very good. Plus being home, I can get my fill of baseball since there’s only a few weeks of the regular season left. There was no tv while in France, but did check on baseball scores always as the group rooted for the Astros and Braves. Okay enough about baseball! I usually stitch something every year to enter in the exhibit at the American Needlepoint Guild’s seminar. I will admit I have been trying to win the elusive Princess Grace award which is given for a piece executed completely in basketweave. Well this was not my year for that ribbon, but I will try again. I am thrilled that my piece did garner 2 ribbons! A first place in my division and another for Small Masterpiece. So now is the time to think about what to stitch for next year! I think she wants some attention! This entry was posted in general by Vicky. Bookmark the permalink. Needlepoint, morning noon and evening! what could be better than this? I work on the computer in the daylight hours editing stitch guides and drawing stitches that you will see in the next Needlepoint Now for your stitching pleasure! In between this, there is time for taking pictures of my stitching adventures, Facebook and writing stitch guides for canvas that I am stitching for Needle Deeva, Maggie, Ruth Schmuff and others. Mostly needlepoint you ask? well we will talk about my cats Sylvester and AlleyCat, better known as "the brat". Of course I can't forget Felix who was the love of my life for over 14 years. He broke my heart as he departed for the Rainbow Bridge last year. Oh did I mention baseball? Congrats on the ribbons! 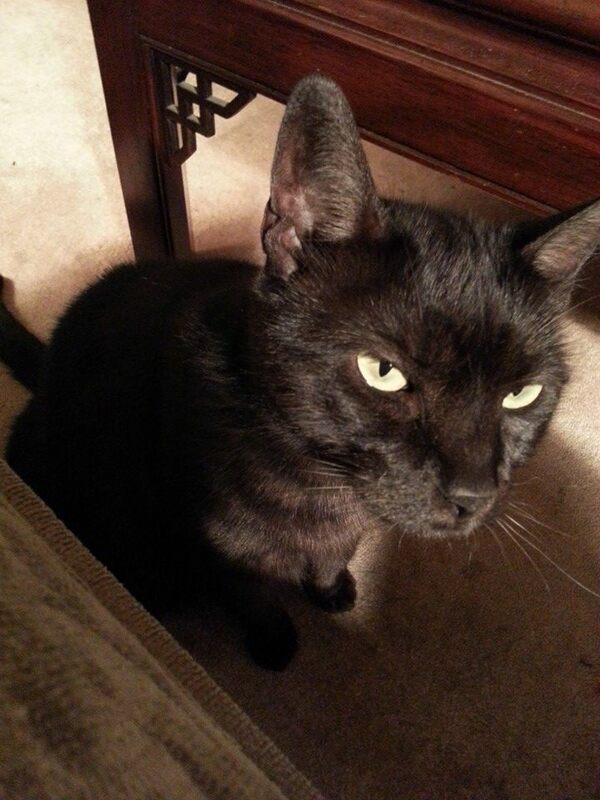 My black cat Bagheera had surgery then complications so he’s sequestered in my office. His sisters sit on the other side of the door. I’ve been sitting with him and hope he’s all better in a couple of weeks. Thanks! And good luck with the kitties! What a beautiful piece. Congratulations on your ribbons! Thanks so much! It never gets old winning that ribbon! 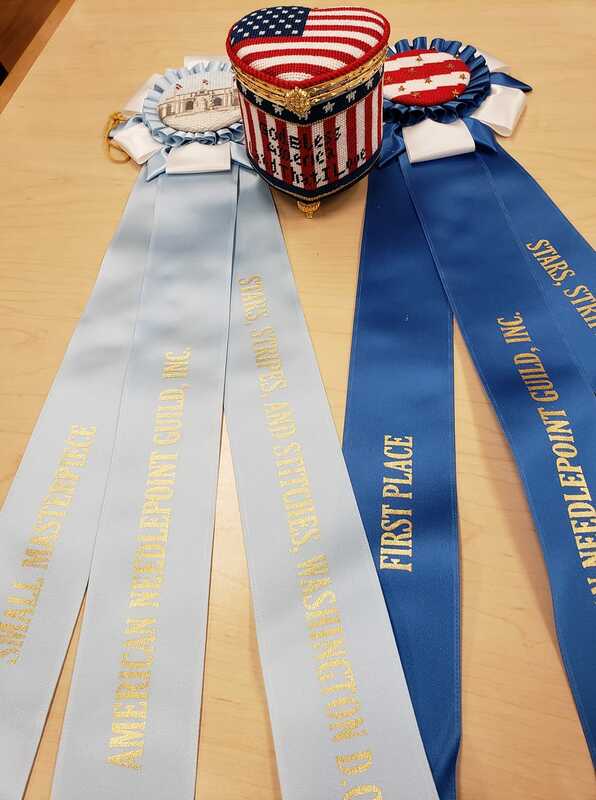 Congratulations on the ribbons. Your piece is beautiful. And I cannot tell for sure from the photo, but is the round part of the ribbon a needlepoint piece? Yes the ribbon centers are stitched. Thanks so much! Looking forward to your trip photos. And congratulations on your ribbon! Thank you! And yes I will share my trip to France… just need to get head above water at the shop first!